PicturesOnGold.com — MumbleBee Inc MumbleBee Inc. I was able to review my very own custom made Build Your Own Locket. 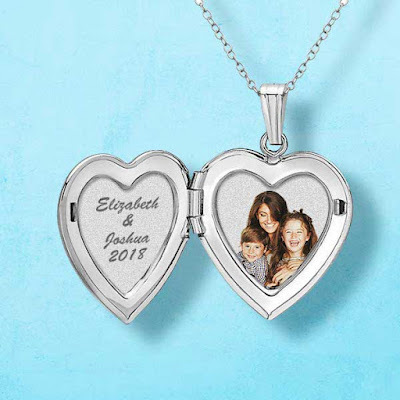 I was able to choose from the front clip art that they provide and inside the locket I chose two pictures one for each side. For the pictures you will need to scan them if you can or you can send in the photo you want engraved within your locket. Then my final step was to put some from the heart words on the back. It was such an easy process. 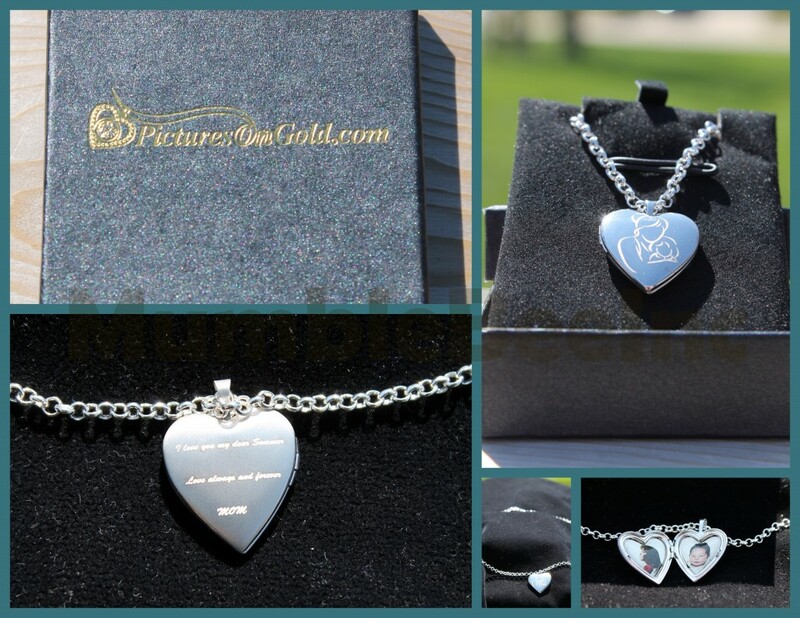 Their locket process is 100% waterproof and scratch resistant. they have the only lockets in the world that can guarantee that! So that makes me very happy knowing my locket will not get ruined by water or get scratched up by normal wear.Plus PicturesOnGold offer a 100% lifetime guarantee and your item will come with a certificate of authenticity stating that guarantee with your own unique code. 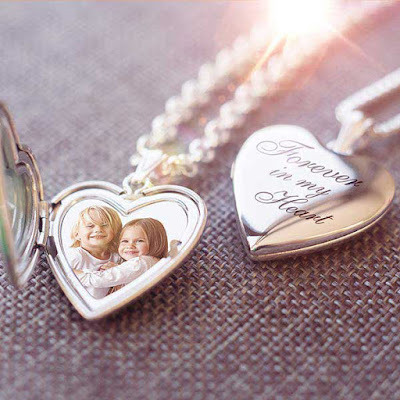 So if something was to ever happen to your locket and you have your code in safekeeping you will be covered. Besides photo and engraving, they also offer custom made jewelry. If you can imagine it, they can make it! Overall the ease of ordering online was a breeze and the quality and outcome of my “Build Your Own” Locket was amazing. The pictures truly do not give it justice and the picture engraving looks amazing! You would have thought I put those pictures in myself. 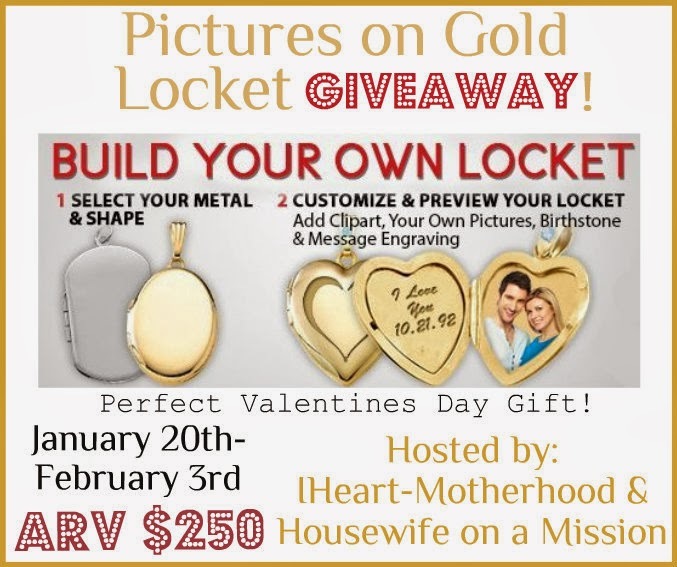 Now you have a chance to win your very own custom made Build Your Own Locket from PicturesOnGold.com. Just scroll down to figure out how! 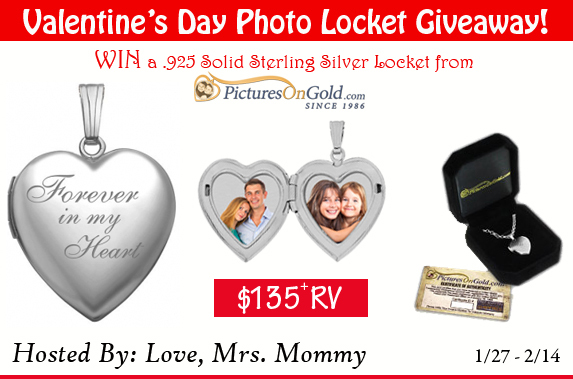 As you know Mother’s Day is coming up soon and what better way to show your mom you care than with a custom made Build Your Own Locket from PictureOnGold.com. If you can not simply wait to see if you will win just buy one today and use Promo Code MOM2014 to save 10% on all purchases made until May 9th. Disclosure: I did not receive any monetary compensation for this post. No purchase is necessary to enter. The participating bloggers were not compensated for this post. We are not associated with any of the companies named above. No purchase is necessary to enter. Void where prohibited by law. The odds of winning are based on the number of entries received Open United States Residents. Confirmed Winner(s) (by Random.org) will be contacted by email. Winner(s) have 24 hours to respond before a new winner is chosen. No purchase necessary. Void where prohibited by law. MumbleBeeInc is not responsible for product shipment/delivery. This event is in no way administered, sponsored, or endorsed by, or associated with, Facebook and/or Twitter, Google, Pinterest. This disclosure is done in accordance with the Federal Trade Commission 10 CFR, Part 255 Guides Concerning the Use of Endorsements and Testimonials in Advertising.here prohibited by law. The odds of winning are based on the number of entries received.